Item shown above : Natural Rosewood with a glossy protective coat (knives not included). Made of solid Rosewood. What a fancy way to display your collectible knives. Made of Natural Rosewood-not cheap veneer or plastic with wooden colorings. 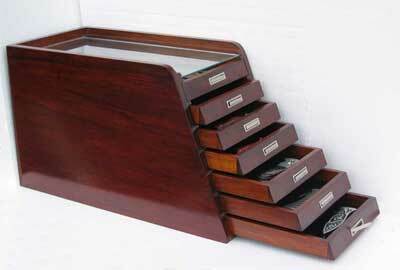 7 drawers with capacity to hold up to 65 knives. Repeatedly sanded to achieve super fine smoothness surface and elegant appearance. Black matted drawers to create a lovely display and protect the knives from damages. Holds up to 60 knives. See through glass top to protect from dust and damage. Bottom drawer can hold knives up to 18 inches.